Episode 9: "The Patient in Room 21"
Barry Chan is in a London hospital recovering from an injury. Visiting his son at the hospital, Charlie Chan confers with chief surgeon George Morley concerning Michael Winstead, another doctor at the hospital. Morley has received a troubling letter stating that Winstead is, in reality, Paul Ligget who was convicted years ago in Ottawa, Canada for committing a mercy killing. To spare Winstead a public investigation, Morley has enlisted the aid of Chan to perform a private investigation in the matter. Barry reminds his father that Winstead, Chan's friend, had saved his life to years ago by removing a bullet from the detective's body. Agreeing to take the case and taking the letter with them to test it for fingerprints, Chan and Barry run into Nurse Elizabeth Vernon who had apparently been listening outside of Morley's office door. It later becomes apparent that Elizabeth and Winstead have a romantic connection. At their hotel that night, Chan and Barry is attacked by a burglar who then steals the incriminating letter about Winstead. At the hospital the next morning, Barry is once again a patient, recovering from the attack that night. Discussing who it was that may have stolen the letter and why, Chan makes an overseas telephone call to the Ottawa Police in Canada. Obtaining the information he seeks, Chan has Barry fly to Canada on a special errand. Returning the next day with a woman named Anne Gerald, who was the euthanasia victim's private nurse and was familiar with Dr. Ligget. Chan and Barry take her to the hospital to prove one way or the other whether Winstead is or is not Ligget. Miss Gerald states that she has never seen Winstead before. Apparently cleared, Winstead admits that he actually is Ligget, offering his resignation. Back at his hotel room, Chan asks Anne why she had tried to spare Winstead. Chan notes that Miss Gerald obviously feels that Winstead was innocent of the crime. Later, at the hospital, Anne, discussing with Winstead how it was actually she who had committed the mercy killing, agrees to issue a confession so as to clear Winstead. Winstead leaves his office to get Chan who will witness the confession. Returning with the detective, Miss Vernon is found lying on the floor clinging to life, having been stabbed with a scalpel. After placing a call to Inspector Duff about the attack on Miss Vernon, Barry returns to inform his father that Sir Edward Pomeroy, the hospital administrator who has been ailing, has collapsed in Morley’s office and will require immediate surgery which will be performed by Morley. Speaking with Sir Edward, Chan informs him that it was probably Morely who attacked Anne, surmising that he feared he would lose his position as head surgeon at the hospital should Winstead be cleared of the past crime. It was he, Chan continues, who had sent himself the incriminating letter. He also suggests that Morley had probably made Sir Edward ill somehow in order to operate on him and kill him in the process, again, to preserve his position at the hospital. Sir Edward cannot believe Chan's accusation. Barry arrives to inform his father that Miss Gerald has just died and that she was not able to state who it was who had attacked her. While Sir Edward is being wheeled to surgery, he expresses his faith in Morley, stating that he will have his job forever. Suddenly, Sir Edward becomes aware that his surgeon is actually Winstead, sending him into a fit of terror. 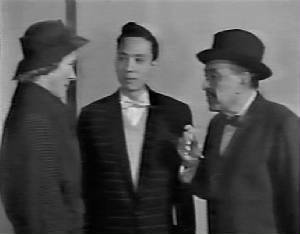 Chan tells Sir Edward why he is so afraid of Winstead. It was actually Sir Edward who had sent the incriminating letter to Morley. It was also Sir Edward who had killed Miss Gerald, hoping to throw suspicion on Winstead. In terror of the prospect of dying at the hands of Winstead, Sir Edward admits his crimes, stating that he did it all for Elizabeth whom he loved, wanting Winstead out of her life. Chan notes that it will be Winstead who will save Sir Edward for the hangman. Unlike postman who takes walk on vacation, I am retired policeman eager for inactivity. Mutual alibi like cracked teacup - does not always hold water. Like expert surgeon, you go directly to heart of problem. Like broken Ming vase, uneasy conscience very difficult to mend.